Lake Erie rainbow smelt (as well as Lake Erie emerald shiners) are pelagic forage fish and prefer to live in the open water of Lake Erie as opposed to round gobies which mostly sit on the lake bottom. Since steelhead are primarily pelagic feeders, both rainbow smelt and emerald shiners are an important forage species preyed upon by them in Lake Erie. Brown trout target round gobies in Lake Erie (which are benthic organisms or bottom feeders) since they are also primarily bottom feeders in the lake themselves. Rainbow smelt are an invasive species native to the North Atlantic and North Pacific oceans. They were introduced into the Great Lakes in the 1930’s (originally as a food source for Atlantic salmon in Michigan’s Crystal Lake in 1912). They have been shown to compete directly with juvenile walleye for food and even consume other fish in their early life stages. Recent trawl survey data in the March 2009 Lake Erie Forage Task Group report shows moderate to high populations of rainbow smelt in Lake Erie (west to east) with an overall higher abundance of rainbow smelt (as well as round gobies) versus emerald shiners (which show a decrease from previous years). Rainbow smelt average 3-4 inches long with adults reaching 7-8 inches long. The Lake Erie Rainbow Smelt tube fly pattern below incorporates a compact Wurm bottle tube (www.tungstenshop.de/) which is placed just behind the wing (on small diameter plastic tubing) and camouflaged under dubbing. This balances the Lake Erie Rainbow Smelt nicely on the swing while providing enough weight to sink the fly without interfering with its lively action. The wing uses T’s Fur (www.tubeflytech.com) which is an extremely soft and semi-transparent natural fiber material that is completely free of stiff guard hairs and excess under-fur, providing superb action in the current flow. Fly finishes out at about 4 inches long. Tubes: Clear, transparent Canadian Tube Fly Co. FlexTube (1 ½ inches long), extra small (.60 grams) Wurm Micro Tungsten bottle tube and Wurm small diameter (1/16 inch o.d.) clear/stiff plastic tubing (2 inches long). Tail (in tube body): 5 strands of pearl Orvis Krinkle Mirror Flash which extends 2 inches beyond end of FlexTube with “taper-cut” ends. Body: Hareline pearl Ice Dub (loop dubbed over front of FlexTube and Wurm bottle tube). Wing (tied on small diameter tubing, from bottom to top): Krinkle Mirror Flash, white T’s Fur, silver Angel Hair, white T’s Fur, plum Angel Hair, Wapsi multi-color smolt blue SLF Hank, plum Angel Hair, dark olive T’s Fur, rusty olive Angel Hair, eight peacock herls. Head: Spirit River polar pearl Lite Brite and 3/16 inch Holographic Eyes epoxied in place. 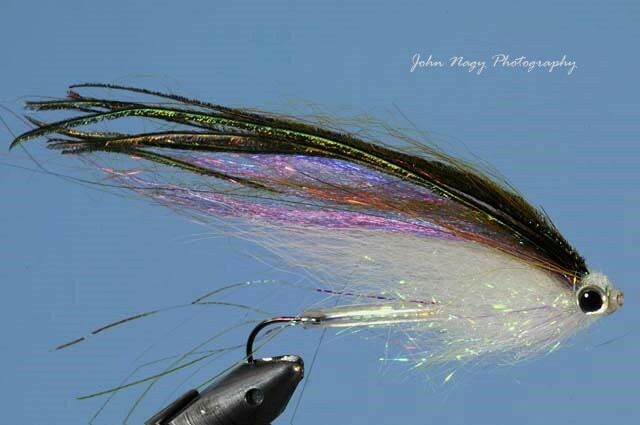 Comments: John Nagy’s Lake Erie Rainbow Smelt was recently featured in the December 2009 issue of Fly Fisherman Magazine along with an article on Cattaraugus Creek, NY by John Nagy. More detailed instructions on tying the Lake Erie Rainbow Smelt can be found in the Tube Fly Chapter of John Nagy’s book “Steelhead Guide, Fly Fishing Techniques and Strategies for Lake Erie Steelhead”.